I generally don’t call out other bloggers when they make a mistake. But this one was so egregious that I simply couldn’t stay silent. Chris over at Mason Conservative has a post with the headline “The Return of Massive Resistance.” The topic, as it turns out, is not Massive Resistance at all; rather, he’s talking about the Senate Democrats’ refusal to pass the budget. I don’t think Chris meant to offend me but he did. This is, after all, Black History Month. 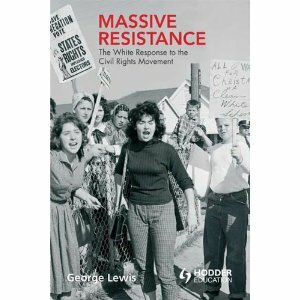 And Massive Resistance in Virginia was another stain on the history of the Commonwealth. To use such a headline is to be insensitive, at best, and ignorant, at worst, of that horrible time in Virginia. Take a look at these old photos, recently uncovered in the newspaper archives, of the Norfolk 17. Our city was one of the ones that closed its schools, resulting in what is known as the Lost Class of 1959, as the result of the real Massive Resistance. You’re absolutely right, Vivian. After all, it’s much more important that the far Left get a monopoly on historical references which imply illegitimate tactics. This is not “far left” or “far right”, it is history. It’s not about a monopoly, it’s about a phrase that has meant the same thing for going on 60 years. Lastly, This phrase is not a euphemism for “illegitimate tactics”. It has a well defined meaning. Nothing fairy tale or “maybe” about an entire generation not being allowed to attend public school. I am surprised that you would have driven by Moton School in Farmville during your time there and not known all of this. It is serious history, serious disenfranchisement and needs to be treated seriously. You of all people should realize this. People are offended by different things. Thanks, Vivian, for using this as a teaching moment. The Massive Resistance reference, while I understand the misuse, didn’t offend me as much as Chris’ comment that, ” Senate Democrats voting against the two-year budget on a party-line 20-20 vote”. Why is it that it is correct for one side to vote the party line, in this case ok for the “R”s, but incorrect for the other side. It seems neither Republicans or Democrats care about doing the jobs for which they are hired. They are only concerned about what their partymates want. Damn, we need a strong third party. as an aside, I guess. I went back to Chris’ blog, and clicked on the link to his profile. Why would a blogger not announce his identity? I sometimes comment on the Pilotonline site with an alias. But even if I think I may get blasted for “important” comments, I use my name. And always on this site, too. Just so I can get blasted. Also, I hope Warren read this comment. Because some of us know that our careers would be jeopardized if we used our full names. I tend to agree with you Doug.